If you are new in the business world, we would like to welcome and congratulate you on your new endeavor and we hope you have great success in what you have chosen. Have you gotten to check your order receipts yet? If not yet, then you are in luck because we are here to help you out! Remember that businesses who issue official receipts to their customers are more reliable and are seen to be trustworthy. It makes your customers feel that you are transparent and with that, they can certainly gain your trust. 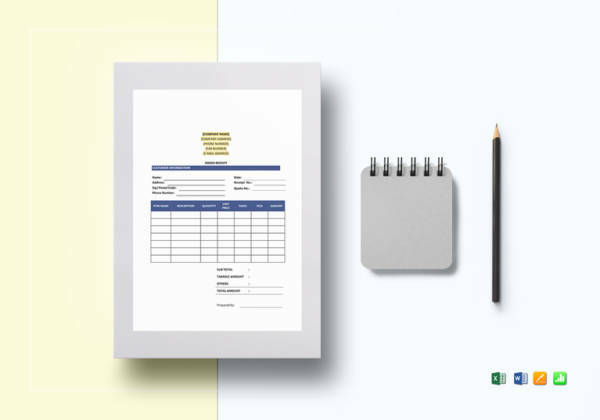 However, you might find yourself on the bend of being stuck at how you can make your own standard order receipts to ensure that your customers get the right information about their order. We are here to help you out with the basics. 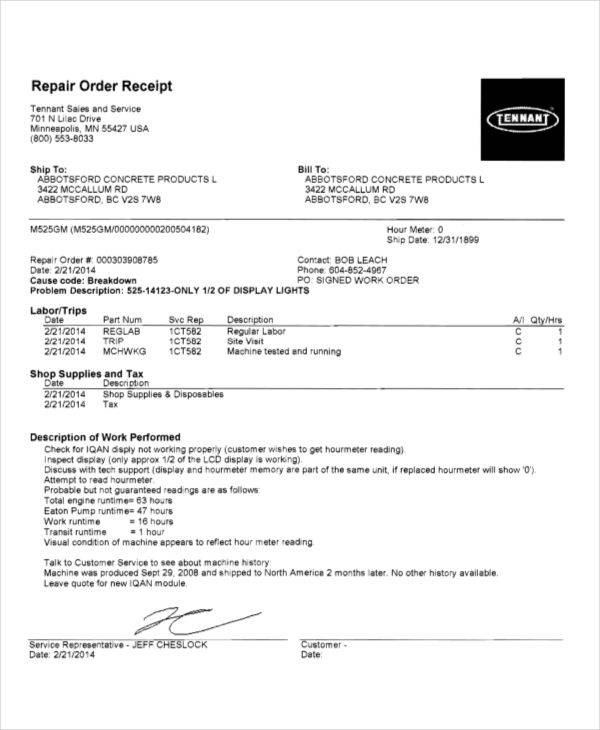 We will let you know what are some of the most common components of an order receipt. 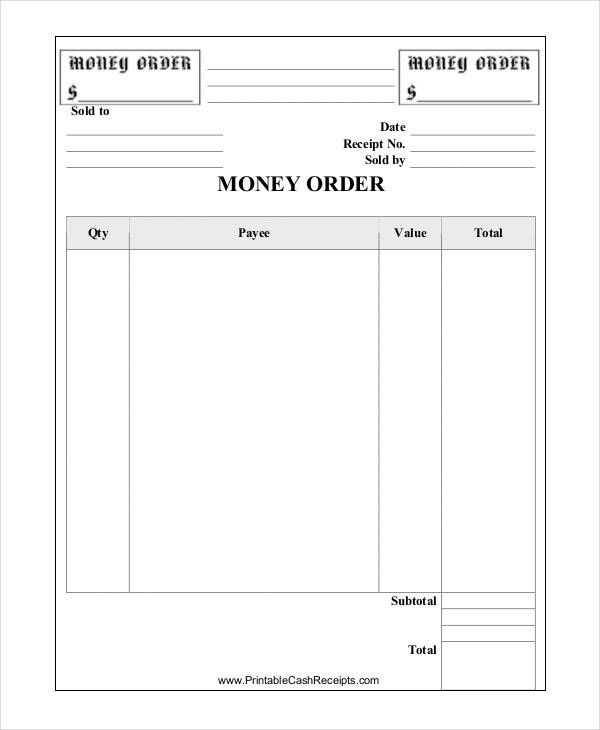 We also have a few sample receipts that are going to be great references for when you start creating your very own order receipts that will look professional and polished. Are you now ready to find out more? Check out this article until the very end. Read on! 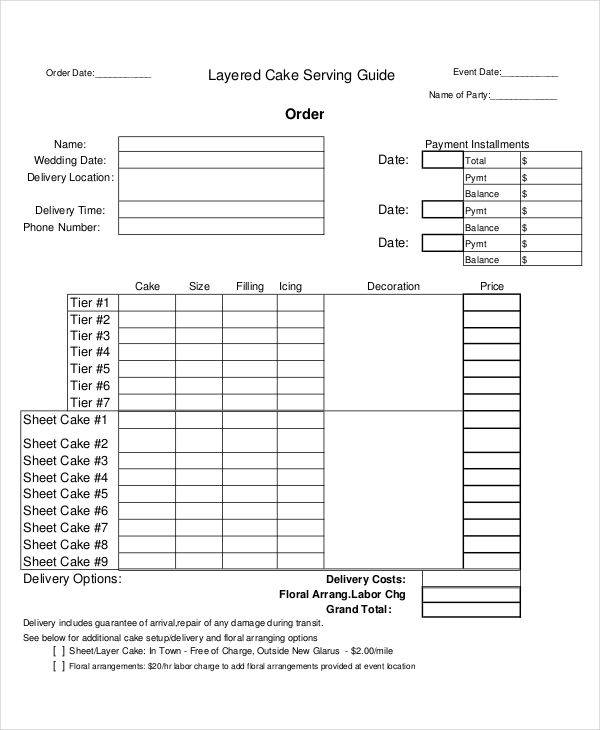 An order receipt is a document that has all the important details about a customer or client’s order/s. 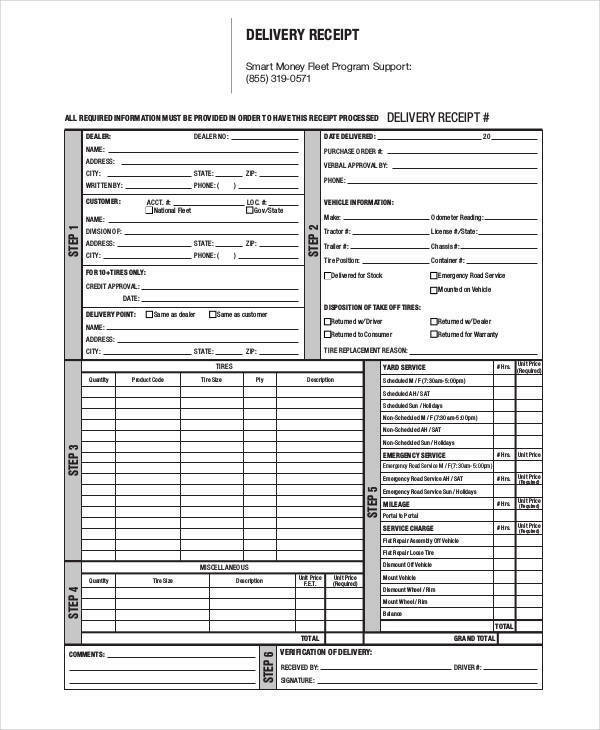 These documents are usually issued as a means of confirming to the customer/s that specific order/s have been received and are now subject to completion. These documents may be sent through fax, email, and even regular mail given that there is an ample amount of time for the order to be processed. This type of receipt serves as a notice to the customer about what he/she has ordered. Most of the time, it will also give out specific information about how the orders can be modified or canceled. Return slips are often attached to these documents for the sake of convenience. Oftentimes, online shops readily give out order receipts before a customer checks out the orders he/she placed. In short, it is a summary of the orders that were placed. An email is usually sent once the customer confirms his/her order on the website. Once the order receipt format has been sent to the customer, there is a slim window for him/her to make all the necessary changes. 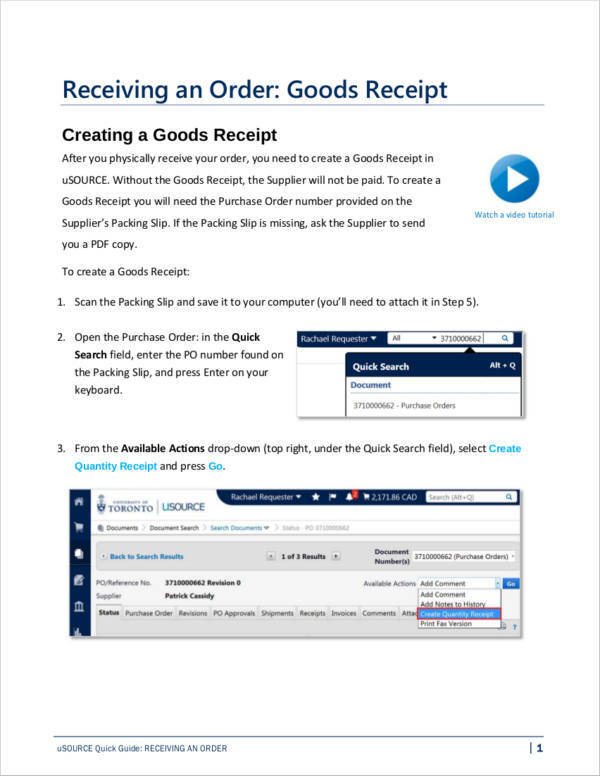 With orders like this, the order receipt is typically sent automatically to the email address or the mobile number provided by the customer. Logo. 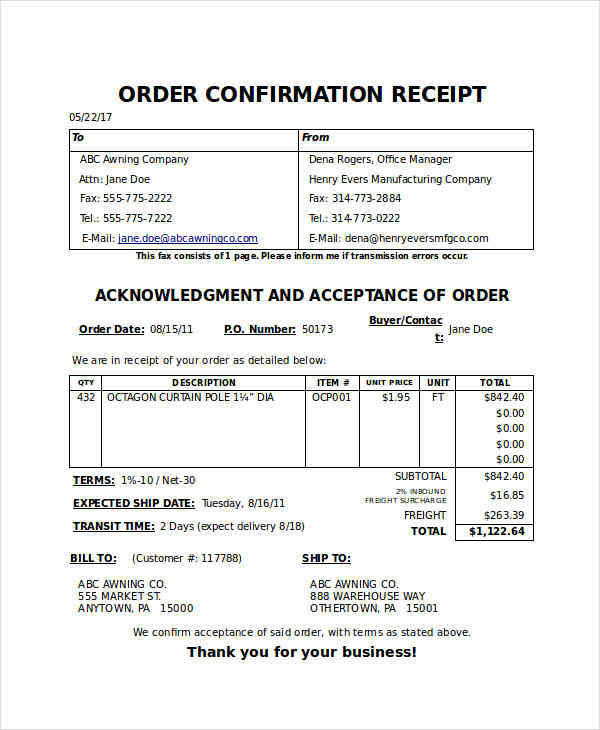 It would be a nice touch to have the logo of your company on the order receipt as it can be the image that would mainly be associated with your business receipts. Order Number. 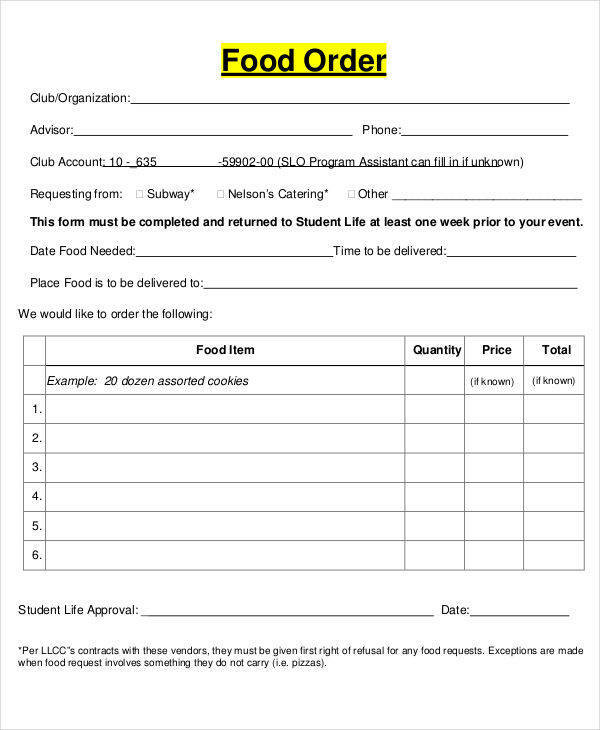 The order number will be the reference number for the order made. Should there be issues regarding the orders such as payments or if there is missing information, it will be easy for the customer to let you know what their issues are. Order Date. This is basically where the date when the order was created will reflect. Name of customer or company representative that will receive the orders (first name, middle name/initial, and last name). Complete address (house number/building name, street name, city, state, and zip code). Date of Shipment. This is where the date when the items were shipped is indicated. If there are items that come from different suppliers, there might also be a possibility that these items will be shipped on different dates. Payment method/s accepted such as check, cash, COD (cash on delivery), deposit, debit/credit, etc. Signature. 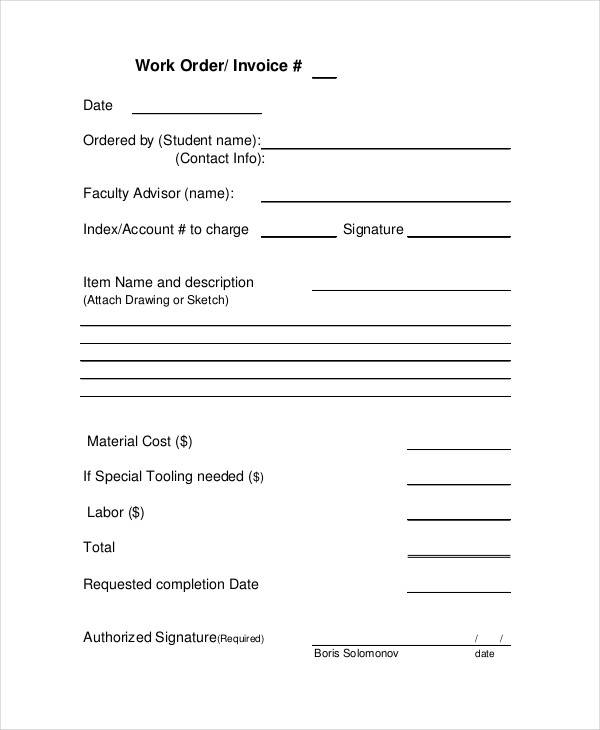 Your signature will serve as the order confirmation that the orders have been received. 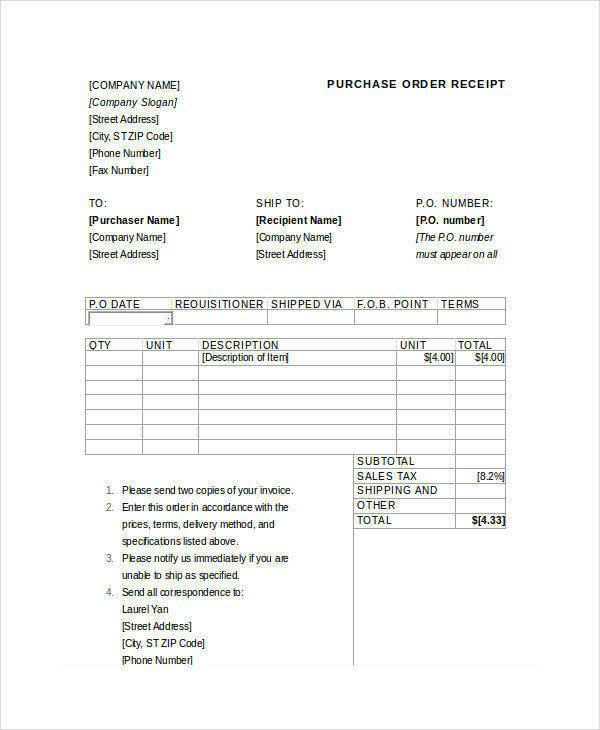 Why Is It Important to Have an Order Receipt? 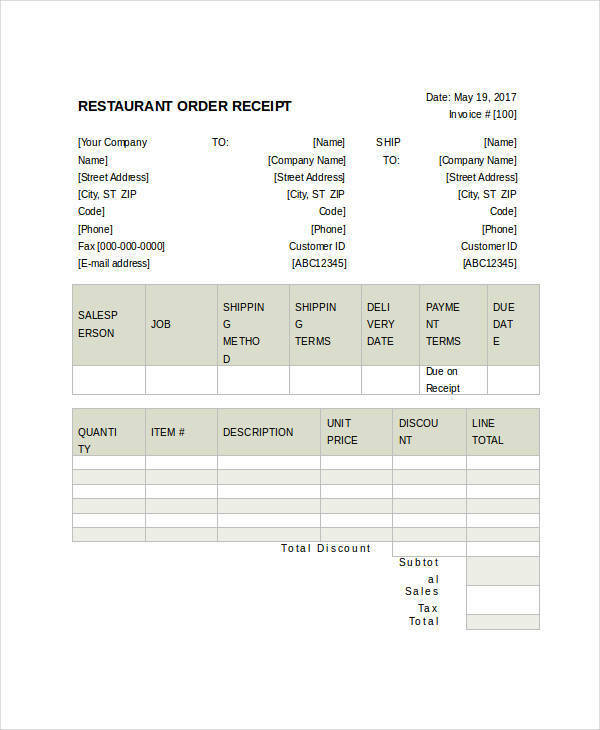 A sales order receipt can be used by your customers as evidence of the transaction that occurred between the two of you. This is especially important if disputes arise or any other problems related to the orders. Your customer can feel that they are secure with their purchase. They are great references for return and exchange situations especially since they are made in duplicate. It can help you, as a business owner, check what the current trends are. However, no matter how important these documents are, if you make a mistake with even the tiniest details, there might be a tendency that your customer might not want to have another transaction with your business. With that being said, you have to review your order receipt for any errors and double-check the details with the customer. 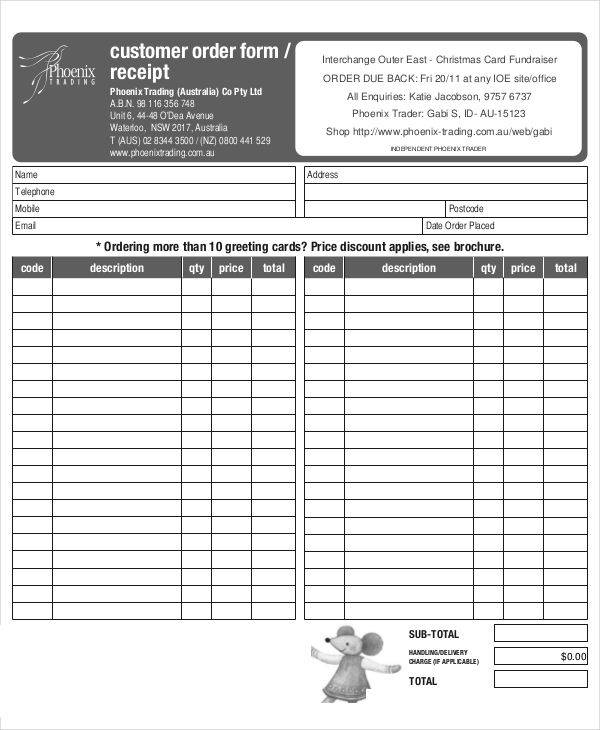 For more information about the importance of order receipts, you may refer to How Do I Print an Order Receipt. You have now come to the end of our article. 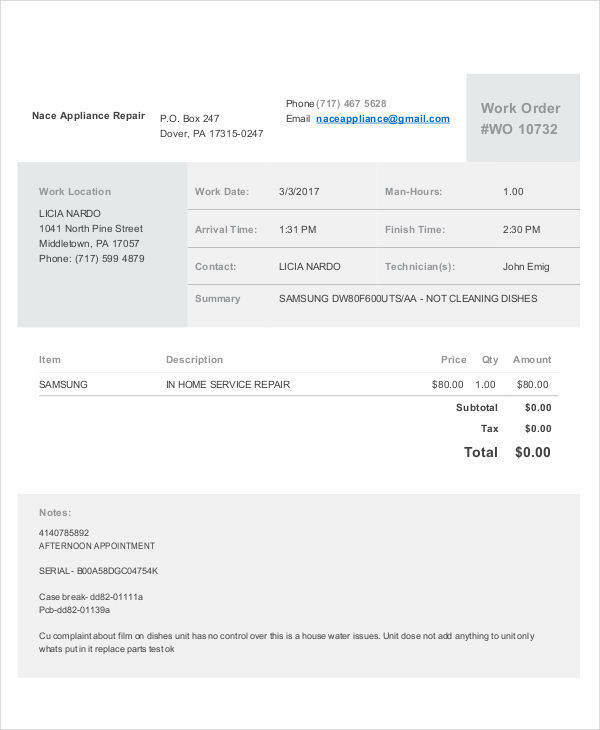 We will now let you in on how you can get a hold of the receipt templates that we have uploaded here just for you. Here’s how you can do it. There are thirteen samples for you to choose from. Choose the one or ones that you think would be a good match for your business’s industry. You can find a green DOWNLOAD button to the right of your chosen sample or samples below the sample details. Click on it. After clicking on the DOWNLOAD button, it will now become a red VERIFY button. Above the verify button is a text captcha that you will need to enter on a text box that you can also find above the VERIFY button. After entering the captcha, click on the VERIFY button. Once you click on the VERIFY button, it will turn into a red DOWNLOAD button. Once clicked, you will be prompted to save the file in a file name of your choice. Once you save the file, extract the file and you now have the raw sample template for your order receipts. It’s that easy!